In general, the development of application solution is a time-consuming process; but with MI/O Extension in place, developers can focus on software and hardware integration to save development time and cost. Solution providers and integrators alike can quickly preempt their targeted markets by using the MI/O Extension platform as the core to pair with a variety of I/O modules. Furthermore, MI/O Extension comes with value-added software services iManager & SUSIAccess to provide intelligent self-management and remote acess function that enhances system reliability. MI/O Extension supports other add-on value functions through Advantech's unique iManager suite which combines hardware, software and firmware technologies together. iManager is an intelligent self-management cross platform tool that monitors system status for problems and reacts to take action if something is not normal. In MI/O Extension, iManager provides a bootup guarantee in critical low temperature environments so a system can automatically recovery when voltages dip. 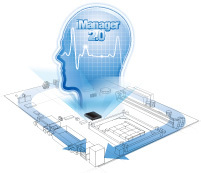 iManager makes the whole system more reliable and intelligent. User-friendly design means customers can execute remote management applications more easily and quickly. Highly effective system recovery and protection program that assures remote device reliability. Deploy, upgrade and maintain Apps to remote devices through a simple friendly management interface.